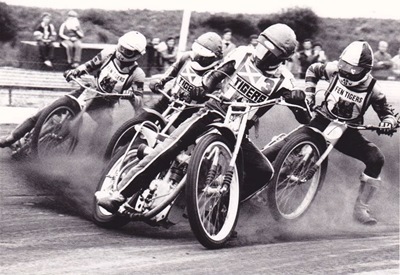 On Friday 11th August 1989, the Tigers played hosts to the Poole Echo Pirates in a National League encounter at Shawfield Stadium. This is the start of the first race with Poole's Alun Rossiter leading from Shane Bowes, Gary Allan and Steve Lawson. The Pirates were everyone's tip for the league title and the match programme's "computer prediction" was for them to win by twenty points! I notice from my programme that I had predicted a less comprehensive defeat by only eight points. This race produced the first of eight drawn heats with Rossiter winning from Tiger's captain, Steve Lawson. By the end of the sixteen-heat encounter, the Pirates left for home without any match points, the Tigers winning 50-45. Kevin Smart of Poole failed to complete a race when he fell following a challenge by Martin McKinna in heat 2 and took no further part in the meeting. Kenny McKinna top-scored for Glasgow with 13 points, followed by Steve Lawson 12, Charlie McKinna 8, Phil Jeffrey 7+2, Shane Bowes 5+2, Geoff Powell 3 and Martin McKinna 2+2. Best for the Pirates were Leigh Adams on 13, Tony Langdon 10+1 and paid 9 from both Alun Rossiter and Craig Boyce. 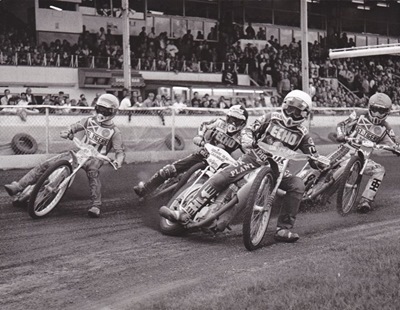 Poole duly went on to win the 1989 National League title and obtained back-to-back championships when they became 1990 champions by an impressive twelve-point margin, loosing just three away matches in the process! This is heat 9 of the British League match at Old Meadowbank Stadium on Saturday 5th August 1967. 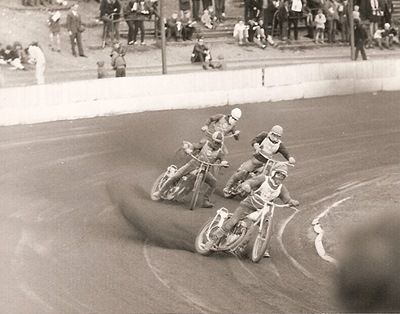 The Monarchs Norwegian ace Reider Eide leads out of the second bend from Poole's captain Geoff Mudge, Douglas Templeton and the Pirate's number one, Kiwi Bruce Cribb. In the late 60's, Reider Eide was idolised by the Monarch's fans and infuriated the Tiger's faithfull in equal measure with his superb lightning-fast starts. Born in Hoyland, Norway on 6th November 1940, Reider Eide started riding for Edinburgh Monarchs in May 1966 and posted a near six-point average. The most notable feature of his first season was a 12-point maximum on 6th August when he set a track record at Old Meadowbank which was never to be broken. His average in 1967 increased to around the nine-point mark; a figure that he matched the following season when the Monarchs moved to Coatbridge. This rose to a career best ten-point average in 1969 and a second track record. In January 1970 came the terrible news that speedway was to end at Coatbridge and the licence transferred to Wembley along with three former Monarchs. Joining Reider Eide at the Empire Stadium were Bert Harkins and Brian Collins. After just one season as a Wembley Lion, Eide rode for nine other clubs over the next ten years, finishing at Wolverhampton where he ended his British speedway career with a final average of just over seven. This image, taken by track photographer Ian Wilson, was used for the cover of the Glasgow match programmes for the 1982 season. It shows heat 7 of the National League meeting at the Blantyre Stadium on Friday 19th June 1981 between Glasgow and Mildenhall Fen Tigers. These two sides were joint-top of the league and the match proved to be a real feisty affair between the two sets of Tigers. Kenny McKinna leads from team-mate Harry Maclean with Robert Henry on the outside and Mick Bates at the rear. The resulting drawn heat made the score 21-21 with six heats remaining. Here is how the Mildenhall promotion described subsequent events: - "Then the trouble started - Richard Knight was excluded after being knocked sideways in heat 8 and heat 9 was just astonishing. First of all one of the Glasgow men was encroaching into Ian Gledhill's gate position. We protested to the referee who ignored us and as a result, when the race started all four riders went through the fence. Charlie McKinna was excluded as the cause of the crash, but Ian was injured [he had 5 points from two rides including a win over the near invincible Steve Lawson]. We put Carl Blackbird in, but the only white helmet cover they had was with Ian in the treatment room. Carl Blackbird had a white helmet so we tried to swap the helmet colour over. The referee wouldn't allow that, then astonishingly excluded both of our riders for not being ready - when they were sitting at the starting line. That left Glasgow's Nigel Close in the race on his own. He broke the tapes but the referee allowed him to stay in and start again! We got a 5-1 in heat 11 and were only three points down [with two races remaining]. Then Steve Lawson locked up in front of Robert Henry in the 12th and of course, it was Robert who was excluded." The resulting 5-1 won the match for Glasgow and the Fen Tigers finished the meeting riding under protest. Indeed the Mildenhall promotion, who were incensed at the handling of the meeting by Scottish referee G. Smith, made an appeal to the Speedway Control Board to declare the result void and have the match restaged. They claimed that senior referee Arthur Humphreys, who was an observer at the match, was shaking his head at the things that went on. The match was not restaged and the result remained at 41-34 for the home side. "Reider Eide was one of my all time hero's, tempremental but a fantastic rider but a Promoters nightmare by all accounts. I have many photos of him10x8, I think Ronnie Allen (the ref) used to take them."